Stop us if this sounds familiar: you have an awesome idea for website branding. You build it, you run it, and…it’s not working. And the longer you think about it, the more you can hear that looming statistic (8 out of 10 businesses fail) and you’re looking a little frantic. Stop giving yourself stress nightmares. Here are 10 reasons your branding isn’t working, and how to fix them. Seems like a pretty straightforward thing to miss, doesn’t it? Here’s the thing. Your website is the promotional tool that never stops working. It’s open 24 hours a day, seven days a week, even when you’re not in the office. And if it doesn’t reflect what you’re company’s all about…well, it’s not doing a very good job, is it? This is especially true if you’ve rebranded recently, or added a new product line. The photos and style of your website should always be reflective of where your brand is right now. You’re driving to work. You’re listening to a classic rock station, jamming out, having a good time. Then, the rock station starts playing an early 00s screamo band. And you’re a) very confused, b) annoyed and c) changing the station. Same story with your website branding. If you’re not consistent, your customers will be annoyed, confused, and not willing to do business with you. If you need somewhere to start, try your slogan. There’s an art to writing a good slogan. Master it, and use it on your whole website. Toto, we’re definitely not in Kansas anymore. By Kansas, we mean black and white, old school and outdated. Seriously, your website technology is not the time to be a hipster. The Internet is constantly evolving. And old themes and technology just don’t work as well under the new rules of the Internet. It may not be compatible with newer browsers, and your customers’ expectations of a website are wildly different. Plus, if your website looks like it’s a dinosaur from the early ages of the Internet, customers aren’t going to think you’re a legitimate business. If you need somewhere to start, start with web design. You’re preaching to the choir. Except you’re in a mosque. And everyone’s confused. Your target audience is everything. They’re the people who are going to be your loyal readers, who will be most willing to buy from you and tell their friends and family about you. But if your website branding conflicts with their wants and needs, they aren’t going to stick around for an encore. And before you can protest: yes, you do need to consider the audiences of tomorrow. But you can’t think of the audiences of tomorrow if you don’t even have a core audience. Some of this has to do with choosing the right keywords. You aren’t going to optimize “red dress” if you sell CBD oil. No getting around it. If your content isn’t working for you, your website branding won’t succeed. And it’s not just about having great content – it’s about creating quality content searchers will actually find. So if you’re considering a redesign, it might be time to revisit your content strategy or vice versa. Make sure that the content you put out there is primed for your target customer to find it. It’s harsh, we know, but if you’re dry as the Sahara, no one’s going to find out how awesome your content and products are. They’re either asleep or already clicked on another website. It’s especially easy to run into this problem if you’re scared to push your website branding too far for fear of alienating your audience. But if you’re trying to attract everyone through total blandness, you’re not really attracting anyone. Remember: it doesn’t count as successful branding if no one actually remembers who you are. Slow and steady does not win the race. Not when it comes to websites. In fact, 47% of consumers expect a website to load in 2 seconds or less, and a 1-second delay can cost up to 7% in conversions. Besides that, Google uses site speed as a ranking factor. So not only are you losing the customers who actually find you, you’re losing customers who never even had the chance to find you. Like we said. Your website is not the time to be a hipster. Get with the times. And no, it doesn’t count if you have a strategically placed button. A call to action is about getting your user to the right product at the moment when you’ve piqued their interest and curiosity. It’s also about phrasing your call to action the right way. It’s not just about selling something, either – it’s about encouraging your visitor to continue moving through your website in a way that feels effortless. When it comes to branding, a name means a lot. Sometimes, your business grows and changes so that your name no longer reflects what you’re all about. Or cultural events happen that change the connotation of your name. Or your name is very regionally focused when you’re trying to expand your reach further. Whatever the case, your brand name should remain an evergreen reflection of who you are. If it doesn’t, time to go back to the drawing board. The whole goal of website branding is to stand out. It’s hardly successful branding if you don’t actually stand out, is it? We’re not saying that you need to be different just for the sake of being different. There needs to be a point. 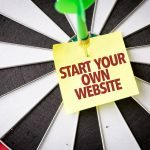 But if you’re just another company website in a long list of seemingly identical company websites, your customers are going to lose interest fast. There’s an art to website branding. And it takes some time to master. Check out our blog for more ideas to help your website stand out from the crowd, like our post on the digital marketing trends you need to know for 2018, or why you need to get a mobile website in 2017. Times are changing. Time for you to change with them.